There are many reasons you do not want to be caught without roadside assistance in Appleton, and one of them has to do with a flat tire. A flat tire could happen for all kinds of reasons; for example, your tires may be too worn or overinflated. Still, some people could get caught without having roadside assistance and may have to change the tire on their own. The following are a few tips to help you do that though we, at Land Rover Fox Valley, recommend getting roadside assistance insurance. 1. First, move your car to a safe location, away from traffic. 2. Find a flat location to reduce the chances of your car rolling backward or forward. 3. Read the instructions in your owner's manual regarding how to use a jack on your vehicle. 4. Place bricks or a large stone behind and in front of the tire opposite of the flat. 5. Remove hubcaps, and begin to lift your vehicle slowly using the jack. 6. Remove the lug nuts from the tire, and remove the tire. 7. 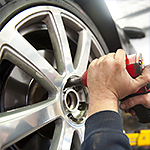 Replace the tire, and tighten the lug nuts without shaking the car. 8. Drive the car a bit, and stop to make sure your tire is secure. Hopefully, you do not have to deal with this on your own, especially if you aren't comfortable, but it is good to know just in case you ever need it.